Anglian Avengers could only manage a 4-4 draw against bottom-of-the-league Bradford Knights at the last 4NCL weekend. However, despite this set back, the Avengers team has managed to guarantee a place in the Championship pool of Division 2 for the latter part of the season. Local players Andy Lewis (FM), Silas Peck and Alex Sheerin contributed towards the successful weekend. Also, new recruit Martin Walker (FM) has kindly and honestly annotated one of his two victories (see below), which contains some co-commentary from Andy and a very interesting rook endgame. Avengers Captain, Paul Talsma, had the following to say after the successful first three weekends of play. "This was somewhat disappointing, but it was offset big time by a splendid 5-3 win against Manchester on Sunday who had a strong squad out and reminded us that we lost to them the previous time we played them: so we might want to avenge / revenge this! This is exactly what we did! Martin and me were the last men standing and we both managed to win. Martin opens his score for the Avengers with a solid 2/2. He seems to be our rook ending expert because both of his wins were interesting rook endings. Well done Martin and lots of thanks! Because of our win on Sunday we are now 100% certain we made it to the promotion pool. We can go on now gunning for promotion." I had this position, as White, last evening, with me to play. In the cold light of day, it's not difficult to find the best move. But I was down to a couple of minutes and played it safe by 26.Bxa8. There's a much better move which wins very quickly. I'm sure you will all see it. The first of three Sunday double headers saw Suffolk paired against Cambridgeshire, then Bedfordshire. The morning match v Cambs was expected to be hard fought, and so it was. Although we held a notional four grading point advantage it was only at the end that we pulled ahead. Wins from the immensely experienced Gregory, Wallis, Feavyour, Sanders and Ruthen led to a 9-7 victory, with eight draws. We were expecting an easier match v Beds, given the 14-2 score line last time we played, but the match proved to be even tighter than the morning match. 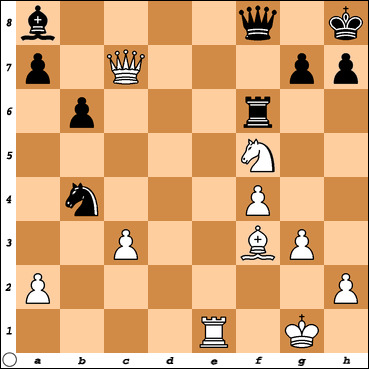 Only a delicate endgame squeeze by Ted Mathewson (accept doubled pawns at your peril v Ted) saw us home by 8½-7½. Ted's was the last game to finish and when down to less than five minutes Ted forgot to press his clock after moving. He must have “heard” the 15 silent screaming voices because he realised in good time, advised his opponent that although he (the opponent) was thinking, it was Ted’s clock that was running(!) and delivered the critical win. I suspect his opponent knew VERY well that Ted’s clock was ticking towards oblivion. Thanks to Hopkins, Gregory, Lewis and Quader for the other wins. Steve Gregory leads the “no prize at all” competition for most points scored, with two wins. It was also good to have Dave Spence available, and also Luke Hill for the first time. Both of these players gave great solidity at the top end of the team. WE lead the table as the only team with two wins. We now face Norfolk and Cambs on 3rd February. The January 2019 ECF grades were published last week. They can be viewed in full here. Several Suffolk players have enjoyed substantial improvements in their grade. The greatest increase (+19) is by James Pack (Bury St Edmunds), who has risen from 136 to 155. He had been hoping for 160+, but he only played 25 games (+18, =3, -4) in the half-year up to the end of December 2018, so five ‘legacy’ games (at an average of 136) would have dragged him down. There is a new Junior at the top of the Under 18 list. Long-time leader Alex Sheerin (177) has been pipped by Jaden Jermy (178). Jaden is at #9 in the national list of Under 14s. Maintaining third place is 12-year old Adam John (149), with a further four juniors graded 100 or higher. The top girls are 10-year old Amy John (98) and Jenni Rochford (79). Jenni squeezes in at #98 in the top 100 Under 16 girls. As usual, there are few women in the list, with only former Suffolk Ladies’ Champion Vicky Allen graded over 100, as well as Saxmundham’s new member Sarah Rowles. Alan Merry (242), Adam Hunt (229), Adam Taylor (226), Mike Harris (219), Graham Moore and Andy Lewis (both 216), Ed Player (211), Dagne Ciuksyte (210) and David Spence (203). That would be some team in they were all willing to play for Suffolk in the County Championships! Hastings and chess have a long history going all the way back to the famous Hastings 1895 chess tournament. 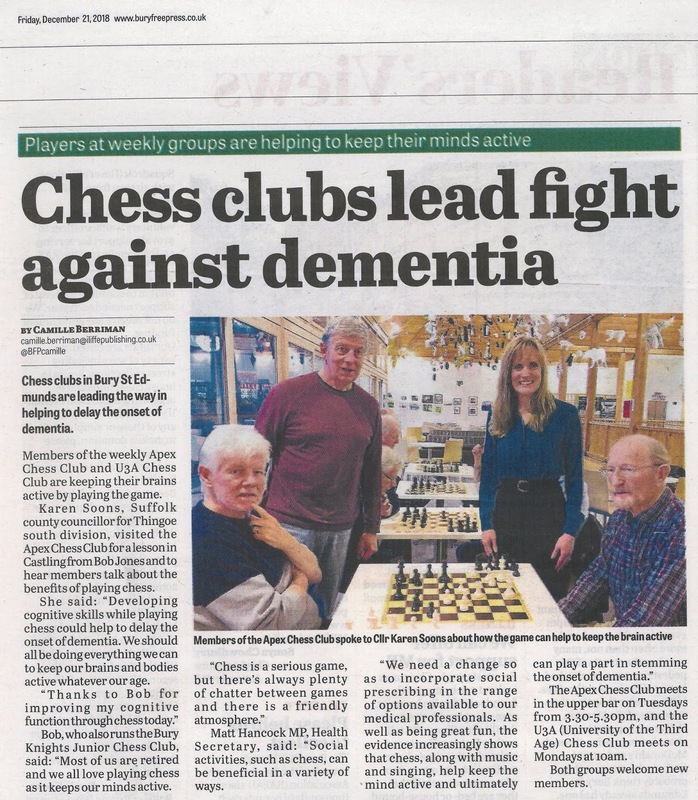 The 2018/2019 Hastings Chess Congress featured Ipswich's Graham Moore and Manningtree's Adam Taylor, who both played in the 10 round Masters section. 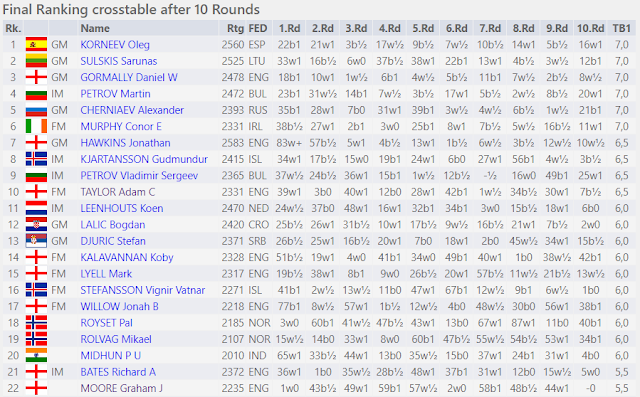 The final standings (extract below) are available from the chess results website. Graham (scoring 5½/10) and Adam (scoring 6½/10) performed excellently, both gaining ELO points which should help improve their national rankings in the next FIDE rating list. In fact Graham really scored 5½/9 as like many other participants he opted for a zero point bye in the final round. Adam managed to get himself up to board 2 in the final round where a win would have seen him end up in joint first place. Still, a draw with Black against former British Champion, Jonathan Hawkins, isn't bad going! The eventual six winners represented six different countries: Spain, Lithuania, England, Bulgaria, Russia and Ireland. Also, on New Year's Day Adam won the Hastings FIDE-rated Blitz. Congratulations Adam! Games from the Masters tournament are available from the chessbomb.com website. In the first standard-play game, Alan (Black) was a little fortunate to draw. Nunn made a couple of weak queen moves and Alan was able to finish the game through perpetual check. In the second standard-play game, it was John Nunn who was lucky. Although Nunn's attack looked dangerous, it was an illusion. Alan missed 28. Re1, which would have given him a winning advantage and after a grand exchange of pieces, the game petered out to a draw with opposite coloured bishops. So after two draws, the match progressed to two Blitz games (10 minutes + 5 seconds increment). Alan won the first after Nunn blundered in a drawn endgame. In the second game Alan missed a number of saving moves and, deep in time trouble, was mated. So the match went to the dreaded Armageddon, where White has five minutes and Black has four minutes. There are no increments unless the game exceeds 60 moves. But White must win, since a draw counts as a win for Black. Alan had the Black pieces. This is where the fun starts! Nunn was in a winning position after 24 moves, but then inexplicably spent nearly 90 seconds on his 30th move and continued to move rather slowly for a few more moves. When Alan tried to force home his a-pawn, Nunn, with only 9 seconds remaining, spent a further five seconds on move 34 and was unable to complete his 35th move, giving Alan the win. At that point in the game, Stockfish gives White a forced mate in 12, an impossibility anyway in five seconds, as there were no increments. Perhaps, at the end, age did tell. Alan will now face third seed GM Gawain Jones in the quarter-finals tomorrow (Sunday), with the first of two standard-play games commencing at 10.00.